In 1969, when Neil Armstrong set foot on the Moon, there was a great demand for easy-to-use cameras on Earth that may have been set off some years earlier by Kodak's 126 film cartridge system. 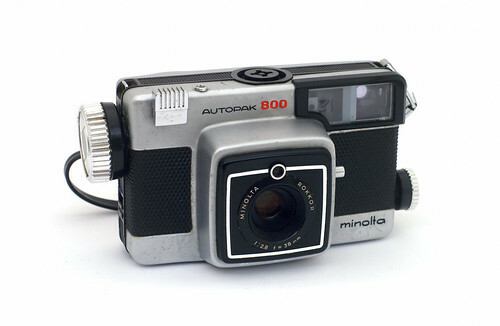 The Minolta Autopak 800 was a rangefinder camera for this format. It had a built-in mechanical clockwork motor for automatic film advance that could be wound up - with the knob on the user's right side - for making a series of 12 exposures. Like many other cameras for the format, it had a connector for flashcubes that turned 90 degrees after each exposure to get the next of four bulbs into firing position. Unusually for a 126 camera, the body has both cable release socket and tripod bush. Shutter: speeds 1/45 sec. in flash mode, otherwise 1/90 sec.